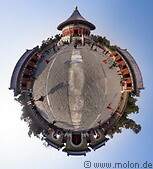 The Temple of Heaven (天壇, Tiāntán in Chinese) is a set of religious buildings contained in a 276 ha park in Beijing. 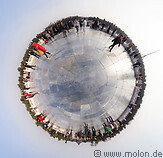 It's located in the southern Dongcheng District, a few km south of the Forbidden city. 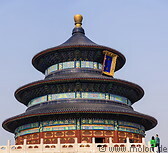 Initially built between 1406 and 1420 under the reign of the Yongle emperor of the Ming dynasty, it was expanded over the centuries. 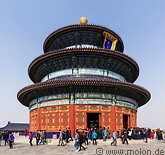 The most significant structure in the Temple of Heaven complex is the Hall of Prayer for Good Harvests (祈年殿, qíniándiàn in Chinese), a colourful triple-gabled circular building, with a diameter of 36m and 38m tall. 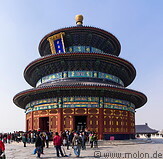 South of it there is the imperial walkway bridge, which leads to the Imperial Vault of Heaven (皇穹宇, huángqióngyǔ in Chinese), a single-gabled circular building. Further south there is the Circular Mound Altar (圜丘坛, huánqiūtán in Chinese), an empty circular platform on three levels of marble stones. 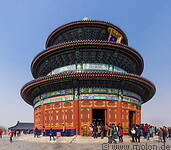 The Temple of Heaven has been a UNESCO World Heritage Site since 1998.